Echinoderms have an extensive endoskeleton composed of magnesian calcite, a form of calcium carbonate that contains small amounts of magnesium carbonate and occluded matrix proteins. Adult sea urchins have several calcified structures, including test, teeth, and spines, composed of numerous ossicles which form a three-dimensional meshwork of mineral trabeculae, the stereom. The biomineral development begins in 24-hour-old embryos within the primary mesenchyme cells (PMCs), the only cells producing a set of necessary matrix proteins. The deposition of the biomineral occurs in a privileged extracellular space produced by the fused filopodial processes of the PMCs. We showed for the first time that signals from ectoderm cells overlying PMCs play an important role in the regulation of biomineralization-related genes. It is believed that growth factors are produced by ectoderm cells and released into the blastocoel where they interact with cognate receptor tyrosine kinases restricted to PMCs, which activate signaling cascades regulating the expression of biomineralization-related genes. We demonstrated the implication of a TGF-beta family factor by a perturbation model in which skeleton elongation was indirectly blocked by monoclonal antibodies to an extracellular matrix (ECM) protein located on the apical surface of ectoderm. Thus, it was inferred that interfering with the binding of the ECM ligand, a member of the discoidin family, to its cell surface receptor, a βC integrin, disrupts the ectodermal cell signaling cascade, resulting in reduced or aberrant skeletons. 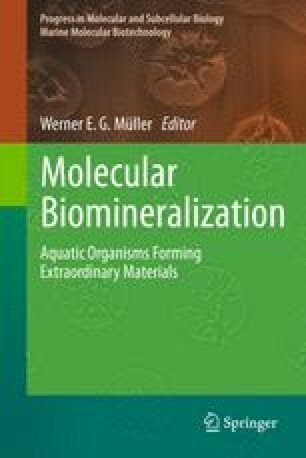 During the last few years, we analyzed the expression of biomineralization-related genes in other examples of experimentally induced skeleton malformations, produced by the exposure to toxic metals, such as Cd and Mn or ionizing radiations, such as UV-B and X-rays. Besides the obvious toxicological implication, since the mis-expression of spicule matrix genes paralleled skeleton defects, we believe that by means of these studies we can dissect the molecular steps taking place and possibly understand the physiological events regulating embryonic biomineralization. This work was supported by the BIOMINTEC Project (European Commission N° PITN-GA-2008-215507 grant). Authors are indebted to Prof. Frederic Marin for access to and help in the use of the SEM at the UMR 5561 CNRS BiogÕosciences, UniversitÕ de Bourgogne, 21000 Dijon, France. Authors thank Mr. Mauro Biondo for his valuable technical assistance.